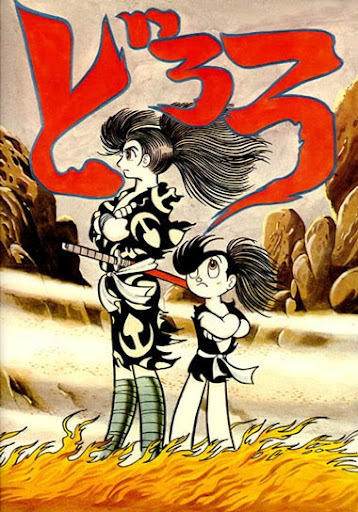 Recently, I reread one of Osamu Tezuka’s many masterpieces, Dororo, which is set in the Sengoku (or Warring States) period and tells the story of a wandering samurai, Hyakkimaru, and the eponymous orphaned thief who accompanies him on his quest to defeat 48 demons. For a manga published in the late 1960s, Dororo is as gruesome as it is radical: alongside graphic depictions of children and villagers being slaughtered by samurai and lords of Japan, we see these same commoners rise up and fight back against their oppressors with their own fists and wits. But Dororo is an empowering tale for many other reasons. Let me backup a minute. Why does Hyakkimaru have to defeat 48 demons? It all goes back to before he was born, when his father, the lord Kagemitsu, forged a pact with 48 demons in order to gain absolute control of Japan. Kagemitsu promised each of these demons a body part from unborn Hyakkimaru as a sacrifice. The demons, newly liberated, then flee to the countryside to wreak havoc on villagers. As a result of his father’s greedy pact, Hyakkimaru is born as nothing more than a torso, with empty holes for eyes, a nose, and mouth. Deemed useless and incapable of survival by his parents, he is sent down the river in a washbasin to die. As luck would have it, a talented doctor finds him, raises him, and builds him a series of prothstetics so he can move. Hyakkimaru is only able to communicate telepathically (since he lacks a voice) and also develops other supernatural abilities. Hyakkimaru has a relatively happy childhood, but ghouls and demons end up being drawn to him because of his powers. In order to maintain his adopted father’s safety, he leaves. The doctor attaches swords to his body, underneath Hyakkimaru’s prosthetic arms. With the help of a blind monk he encounters, Hyakkimaru becomes a formidable sword fighter, and learns that in order to recover his body parts, he must defeat all demons. So, while yes, Hyakkimaru’s main goal is to defeat the demons to regain his body parts, this is not because he resents the way that he was born. (Hyakkimaru is more fixated on the fact that he was abandoned by his birth parents rather than his 48 missing body parts; he’s pretty pissed off about that.) Hyakkimaru doesn’t necessarily aim to become “normal”–for him, this is his normal. Rather, he seeks to regain what was taken from him by his father. It’s less so about him becoming able-bodied, and more about him gaining autonomy and control over his own body and destiny, which were unfairly altered. With a sword and his own tenacity, Hyakkimaru goes from being a “worthless” child to an independent, capable man. Hyakkimaru’s disabilities are not invisible, but rather seen as an aspect of his daily life and at times, a strength. In today’s media, characters with disabilities are rare, and given one dimensional personalities and storylines. They are frequently included in television shows and literary works as an afterthought, and usually play second-fiddle to the more able-bodied main characters. Through the eyes of the reader we think of Hyakkimaru as a hero and a complex person, rather than a culmination of his disabilities. What I think is even cooler about Hyakkimaru’s character is how the author addresses his interactions with other characters. When we encounter characters with disabilities in literature, they are frequently demonized and seen as “scary.” Take for example, Quasimodo in The Hunchback of Notre Dame, or even Captain Hook from Peter Pan. While Hyakkimaru can’t escape the “monster” label placed upon him by other characters, the reader isn’t led to despise or fear him. Instead, the reader thinks of Hyakkimaru as a hero–someone who selflessly fights for those who are vulnerable, and protects those who are closest to him. Sadly, many times after Hyakkimaru saves a demon from a village, he and Dororo are cast out because his abilities and appearance terrify the commoners. But the reader isn’t led to believe that the villagers’ actions are justified, even if they are fearful. Take for example, when Hyakkimaru saves a village from evil moth-like demons and Dororo is injured. In the battle’s aftermath, Hyakkimaru simply asks for a place to stay so he can tend to his companion’s wounds. At first, the villagers refuse to help them because Dororo is a thief. When Hyakkimaru criticizes them for being “heartless jerks,” they then attack his disabilities. “Yeah, and you give us the creeps…” one villager comments. “What’s with your arms and legs… were you dismembered?” another asks, inappropriately. “We don’t need your kind here,” another adds. Thus, Hyakkimaru is cast out by the people who he risked his life to save. In the pouring rain, he somberly carries Dororo out of the village, and works to heal her. In this scene, Tezuka is really trying to demonstrate the cruelty and inhumanity of the villagers. Hyakkimaru’s disabilities and Dororo’s persona should be irrelevant, and the villagers should have been kinder. Through these interactions, the reader is led to resent the villagers for being selfish, ignorant, and above all, unbelievably cruel. Aside from Hyakkimaru and the blind monk, there is one other character who seems to have a disability, although it’s unclear what one. In the translated version I have, which is an omnibus published by Vertical, the girl, Oyone, speaks in broken phrases, implying that she either has a cognitive disability or a speech impediment. We meet her in the chapter, Donburi Belly. Because of how she acts, she is relentlessly teased by the other children in her village. But Hyakkimaru treats her like she isn’t different than anyone else. Unfortunately, Oyone sacrifices herself to save Hyakkimaru in battle, saying that she fell in love with him because he was the only one who didn’t make fun of her. Although brief, it’s a sorrowful moment that leaves an impact. Similar to Hyakkimaru, Oyone went through life feeling like she was worthless and stupid. But as we read the chapter, witnessing her heroic deeds and Hyakkimaru’s resulting grief, we as readers realize just how valuable Oyone’s life is… and how painfully depressing it is that she never got the respect she deserved. I don’t know why Tezuka was drawn to write about Hyakkimaru in such a way. At one point during his childhood, Tezuka became gravely ill and unable to use his arms, so perhaps this experience was an influence in this work. But I would argue that the empowering presence of Hyakkimaru in Dororo largely stems from the disability rights movement, which was gaining traction in 1960s Japan through the involvement of groups such as Aoi Shiba. Although definitely problematic in parts, Dororo stands out to me in Tezuka’s line of work simply because of how it places characters with disabilities in positions of power, and attempts to address the discrimination these characters encounter. While certainly not comparable to Astro Boy or Black Jack, Dororo is a thrilling samurai epic which teaches us not only about the various different types of heroes we may encounter, but of the value of all human lives.